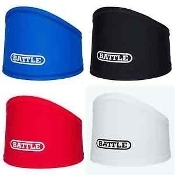 Battle Skull Wrap is made with Dri-FIT fabric to wick away sweat to keep you dry and comfortable. It keeps hair and sweat out of your eyes so you can see clearly and play your best. The Skull Football Wrap has an open top which provides ventilation to help keep athletes cool. Flat lock construction and tapered design allows for a better fitting skull wrap.